On Jan. 19 2019, more than 36,000 people came together in Sacramento to march for women's rights. The women of Granite Bay High School are practicing one of America’s most treasured fundamental values – their First Amendment rights. On Jan. 19 thousands came together for the annual Women’s March in order to demonstrate and advocate for changes they want to see in the United States. The community gathered at the state Capitol building in Sacramento with signs, enthusiastic chants and a vibrant energy. GBHS had multiple students who marched with many from all over Northern California. The signs at the march advocated for women’s rights, LGBTQ rights, wage rights and more. “I went to the march because I support women’s rights and a lot of the issues that they were marching for,” junior Kaiya Lang said. This was not the first Women’s March for many of the attendees, but there were also many new faces, including Lang, who came out to join the group. “I was very interested about learning more about the march, and I thought this would be a good opportunity,” Lang said. The march gives individuals the opportunity to use their voices together in order to make their aspirations for the country clear. “I feel like the whole purpose of the march was that women are independent, and if they want something they can ask for it,” Lang said. Now is a time women have the opportunity to use their voices and advocate for their rights more than they ever have before. “There was a lot of high energy, lots of signs, there were bright colors everywhere, it was a huge crowd,” Lang said. Many of the participants were inspired and encouraged by the recent Congressional election results. A record number of women have entered the U.S. House of Representatives, including many of different ethnicities, contributing to more equal representation and empowerment of women. Politicians such as Rep. Alexandria Ocasio-Cortez (D-New York) supported the marches that occurred across the country on social media along with many other influential figures. Although women’s rights were the main theme of the March, the event advocated for much more than just the female movement, but also the rights that represent harmony and equality in a society. “The march advocated for equality of all people, healthcare, racial equality, immigration policies and even more,” Idler said. The Americans who attend the marches are also paving a way for future generations to be involved in their country. 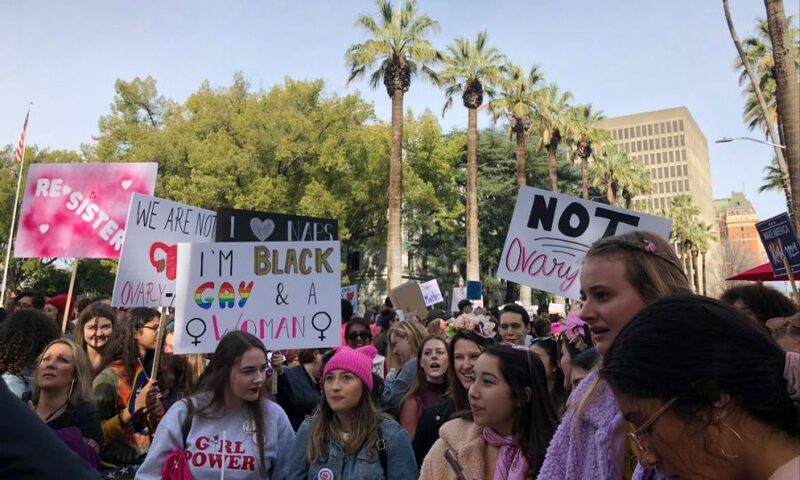 “I would encourage other girls and women to attend the march but also men, because you’re supporting part of the population that doesn’t receive the same rights as the other half,” Idler said. Despite the current turmoil around the nation with opposing political sides, the march is meant to bring people together in order to fight for equality.